TEGAN and SARA Meet and Greet at THE BEACON THEATRE – Rich Russo - The King of Free Form Radio. Posted on Jan 23, 2013 by Rich — Featured, News, Playlists — Add your take! 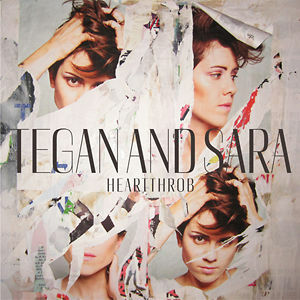 On Tuesday January 29th, Tegan and Sara will be releasing their highly anticipated 7th studio album, Heartthrob. They will be celebrating the release that night with at one of NYC’s most beautiful and legendary venues, THE BEACON THEATRE. Listen this Sunday night (Jan. 27) as I spin some tracks from the new album, Heartthrob, and give a few lucky listeners the chance to win tickets to the show – as well as a meet and greet with Tegan & Sara before they take the stage January 29 at the Beacon. It doesn’t get cooler than that! Tune into Anything Anything on Sunday at 9pm THE PEAK (stream here) and 11pm WDHA (stream here) for your chance to win! RULES: NO PURCHASE NECESSARY, must be 18 or older to win. Winners will receive 2 Tickets for Tuesday January 29 2013 for Tegan and Sara at the Beacon Theatre as well as a meet and greet with Tegan and Sara, which will take place at the theatre at 7pm. Winners will be notified by email on Monday January 28. The prize has no cash value and cannot be sold or transferred.